Equifax, the credit bureau that ignored warnings and failed to update its software, leading to a data breach that exposed private information for half the U.S. adult population, stepped into the crosshairs of Last Week Tonight’s John Oliver on Sunday, adding a bit of levity to this otherwise dire ongoing scandal. Equifax has also been heavily criticized for its response to the breach, including a site that not only might serve up malware, but whose name is easily impersonated. In fact, as Oliver noted during the report, Equifax repeatedly tweeted out the URL of a fake site, securityequifax2017.com, set up to mock the company’s easily spoofed equifaxsecurity2017.com site. But it’s been a month since that happened, so surely Equifax would have proactively snatched up all the URLs that could reasonably be used by scammers, right? Nope. Only a few days ago, says Oliver, his team purchased EquifaxFraudPrevention.com, which not only asks “How are we still able to do this? 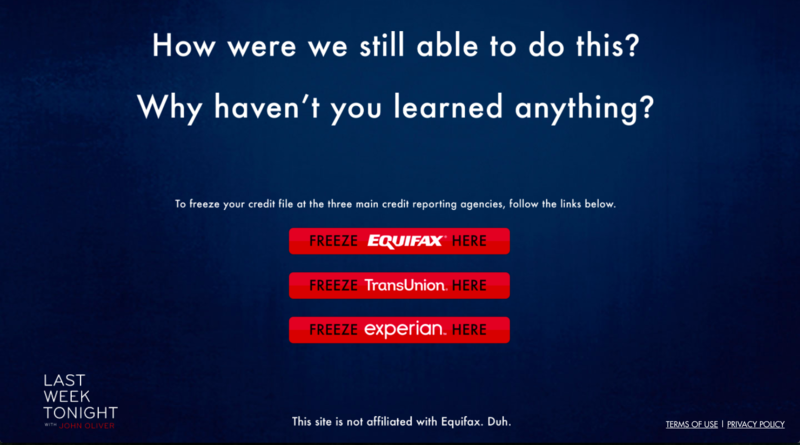 Why haven’t you learned anything?” but also has direct links for people who want to place credit freezes Equifax and the two other credit bureaus, Experian and TransUnion.